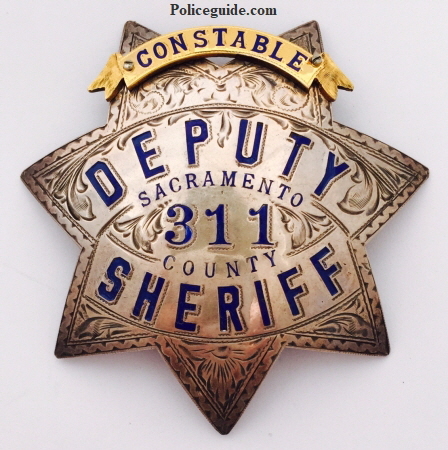 Sacramento County Constable and Deputy Sheriff badge #311. Made of sterling silver, hand engraved, hard fired blue enamel. Constable banner is gold front. 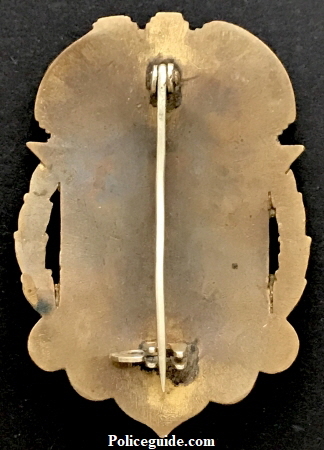 18k gold presentation badge to David Ahern, 1910-1914. 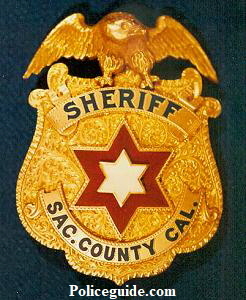 Badge was designed by his wife and jeweler made. 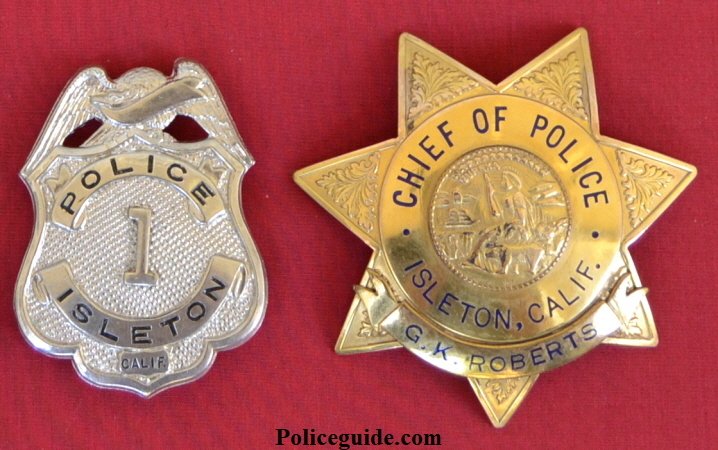 Thanks to Clay Worthley for letting me photograph this badge and all his help over the years. 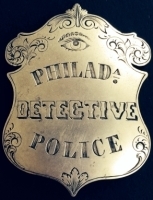 hand engraved. This is the older style before they went to the added rank panel across the top. hand engraved with hard fired black enamel. 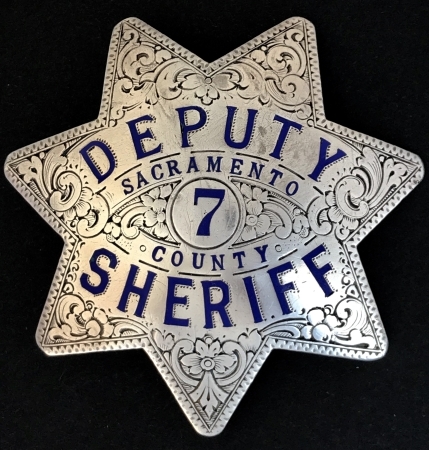 Sacramento Deputy Sheriff badge, nickel shield, hallmarked Ed Jones & Co. circa 1924. 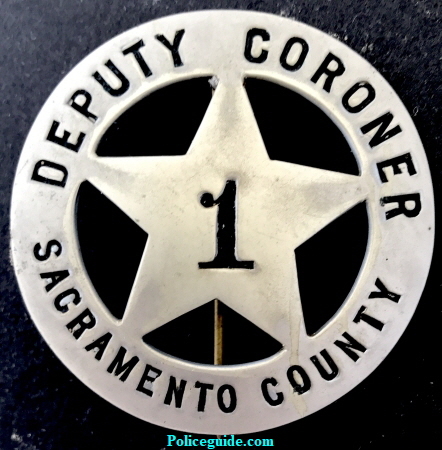 Sacramento County Deputy Coroner badge #1 nickel silver, hallmarked H.E. Sleeper Sacramento, CAL. 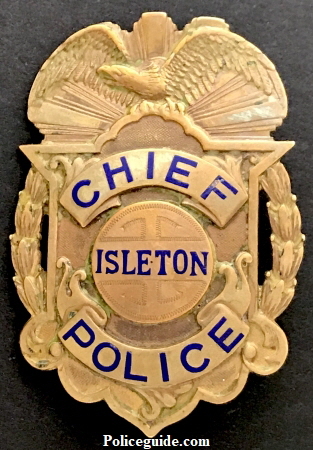 Isleton police badge #1 and Chief of Police badge personalized to G. K. Roberts, made by P. M. & K. on Oct 13, 1949. Rolled gold with hard fired blue enamel. 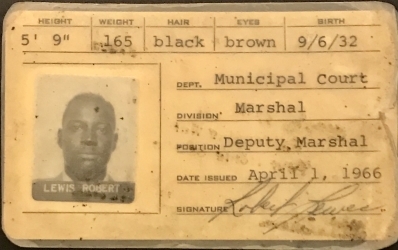 P.M. & K. San Francisco in January 1947 and was obtained from his son, Wm. Fausset on April 6, 1987. 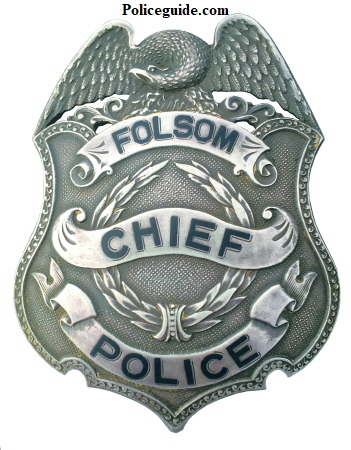 This was the 2nd Folsom Police Chief badge, circa 1950. Made by Irvine & Jachens 1068 MIssion St. S.F. 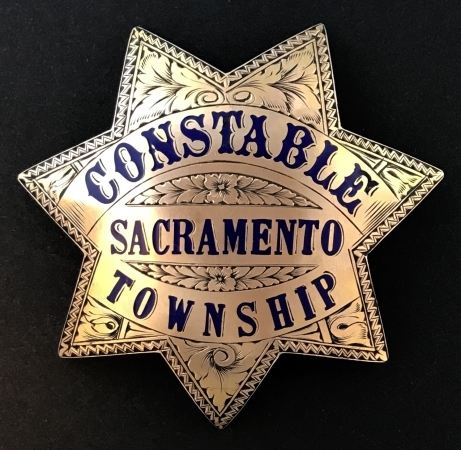 Sacramento County Constable badge presented to Mike Morairity. 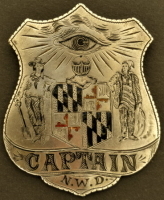 Badge is gold front and beautifully hand engraved. 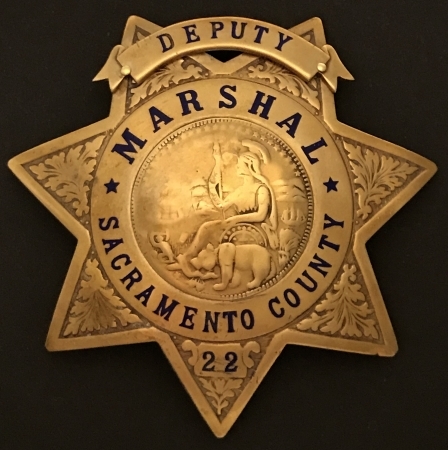 He was born in Colorado in bout 1902 according to the 1940 Federal Census and employment listed as Deputy Constable for the County. 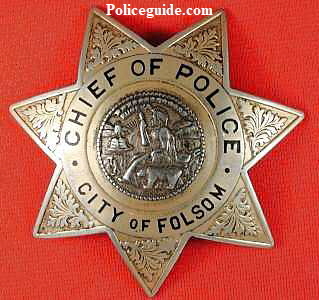 The 1941 City Directory shows him as Constable 3 Court House. 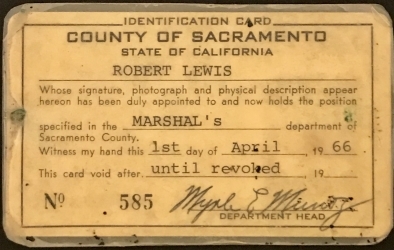 Sacramento County Deputy Marshal badge #22 for Robert Lewis and ID card issued April 1, 1966.
hand engraved. 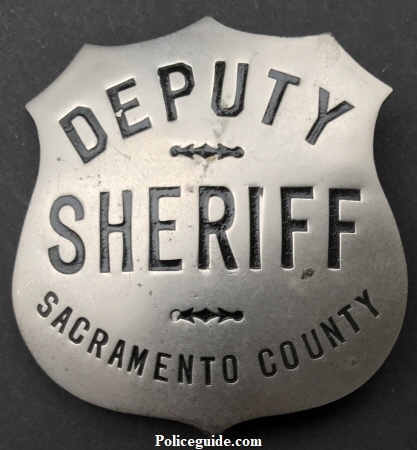 In 1932 the department changed the uniform badge style from a nickle badge to this style. 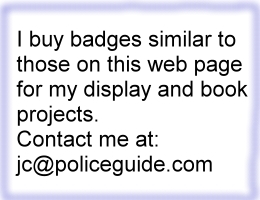 This badge is from the first order of sterling badges.